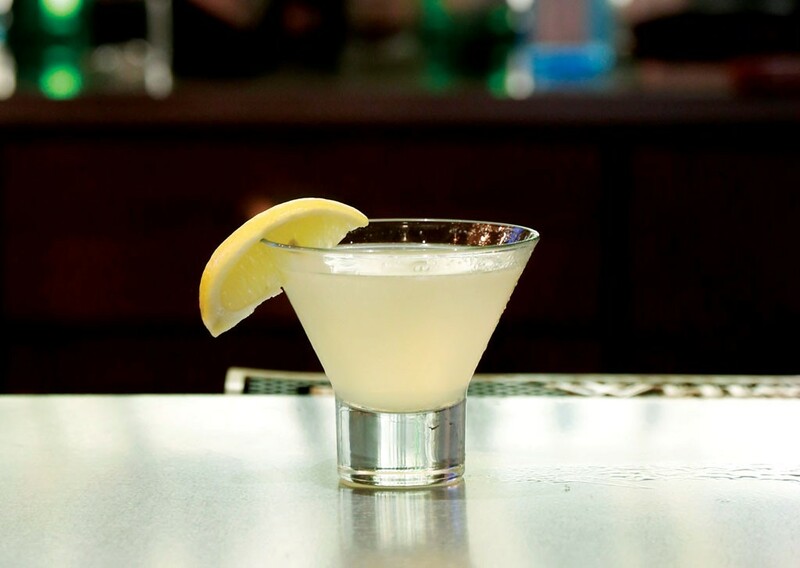 A lemon ginger martini made with Green Mountain Vodka, ginger liqueur, lemon juice, and agave nectar, at the Barrows House in Dorset, Vt.
Save for the cars carrying tourists and a few other modern conveniences, th e quiet town of Dorset looks much the same as it did a century ago. An inn since 1900, the elegant Barrows House long served antiquated food to match its historic setting, an early-19th-century manse that was once the town preacher's home. That changed in 2013, when the Dorset Inn purchased Barrows House and reimagined its dining room. 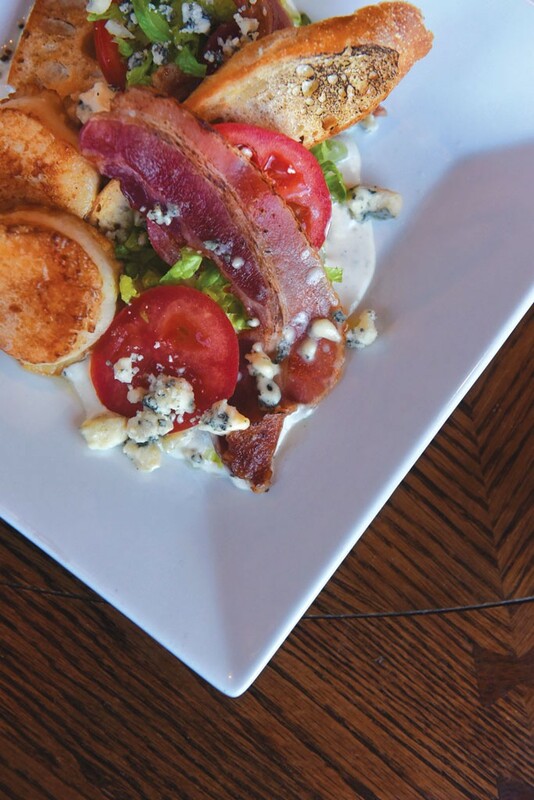 The restaurant is now southern Vermont's first gastropub, and chef Matt LeRay puts an appropriately luxe twist on the tavern fare. Big-name actors such as Tim Daly and Treat Williams have been spotted here, perhaps after performing at the Dorset Playhouse. Stargaze by the fire pit, or inside at the moody, backlit marble bar. A local quarry supplied the stone, the same that built the New York Public Library. The bar offers an array of Vermont microbrews, but why squander the bartender's skill? Have him mix up a maple manhattan using Vermont Spirits Distilling's bourbon, or a Sazerac combining WhistlePig Rye Whiskey and absinthe. A BLT salad, with romaine, "VT Smoke & Cure" bacon, bleu cheese dressing and crostini at the Barrows House in Dorset, Vt. Pair your cocktail with a cone of ultra-thin waffle chips, hot from the fryer and served with creamy chipotle aioli. It's comfort food that would make anyone's inner child salivate, yet grown-up enough to stand up to a sophisticated drink. Wings are a staple at most pubs, and Barrows House is no exception. But in LeRay's kitchen, the meat is duck, confited for optimal tenderness before being fried. Rolled in a spicy ginger sauce, the flesh holds together just until it melts in your mouth. Several appetizers are big enough for a meal. Crispy nachos topped with raw tuna and seaweed salad could easily satisfy a moderate — and perhaps more than moderately adventurous — eater. More interested in the entrées? Indulge in the "steak frites," actually a juicy filet mignon served in puddles of demi-glace and cheddar fondue, then buried in a layer of matchstick potatoes. For a sweet finale, LeRay and his team may whip up a s'mores tart, complete with torched marshmallows, or a creative cheesecake. We tried one with an intense root-beer reduction. Whether dinner ends with a stroll on the town's marble sidewalks or between the sheets of one of the inn's luxurious rooms, a trip to Barrows House seamlessly melds pleasures past and present.